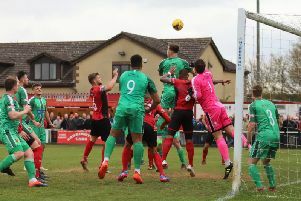 The Poppies looked set to be crowned Evo-Stik League South Premier Division Central champions after Craig Stanley’s first goal for the club had brought them level in the second half following Jamie Willets’ early opener for the play-off chasing visitors. A draw would have been enough as second-placed Stourbridge were held to a goalless draw at Needham Market. 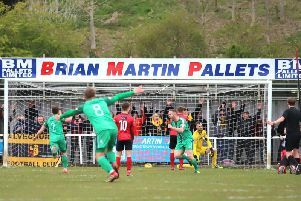 But a rare error from goalkeeper Paul White, who had made some excellent saves earlier in the game, saw Mitch Botfield’s strike squirm between his legs to give Alvechurch the winning goal with just two minutes left on the clock. The Poppies now need just one point from their final four matches to clinch the crown but Law was disappointed after a day that had promised so much ended a bit flat. “We didn’t play particularly well,” he said. “I had a bit of a go at them at half-time and told them to get back to basics and I thought we were better in the second half. “Chances for chances, it was probably on a par. Their goalkeeper has made some very good saves as has Paul White. “I am just gutted for Paul. Over the past two years he has had a lot of clean sheets and he has made an error this time and it has delayed it a bit. “We didn’t have much time to recover from the goal and that sounds a bit hypocritical from me when you look at how many late goals we have scored. Kettering will now make the trip to relegation-threatened Halesowen Town next weekend knowing that a draw will be enough to see them crowned champions. And Law added: “I have been around football too long to know you can’t take anything for granted. “We have got to get a point, we have got to do everything right this week and make sure we rectify what happened this weekend.